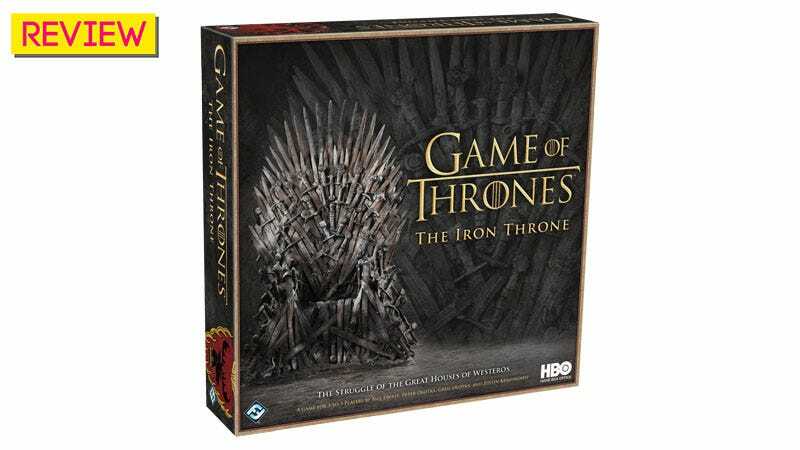 The Iron Throne is what happens when you take pretty much every murderous stereotype about Game of Thrones, break them down then turn them into a board game where you lie to your friends before stabbing them in the guts. Based heavily on an older title called Cosmic Encounter, but here leveraging the immense popularity of the Game of Thrones TV show (and the show specifically, since this game uses photos taken from the series instead of art), The Iron Throne is a a breezy affair which asks 3-5 players to basically take turns fighting each other, while at the same time allowing anyone else not directly involved to join in if they’d like. It works like this: every player is in control of one of five houses at the time of Robert Baratheon’s death. Players take turns to challenge others in direct engagement, during which each house selects one of their members and sets them against their opponent, 1v1. The cards/characters at your disposal in the game. There are five houses included—Starks, Lannisters, Tyrells, Targaryens and Baratheons—with notable exceptions (and looming expansions) surely featuring the Martells, Greyjoys and Night’s Watch. Other houses are then free to join in and support either side. When the engagement is locked in, what normally happens is that players add up the strength of all sides involved, assess any special effects unlocked by using any certain characters, then resolve a winner. Whoever wins gets to exert influence on the losers, and usually the side that is able to exert all its influence on their opponents is the winner. Which sounds simple, and fairly straight-forward. And for the first few turns it is, as players test the waters and fight a few half-hearted battles. Where the game starts to get messy is in its use of diplomacy. During each engagement, players are encouraged to openly discuss their intentions, and are then free to choose one of two ways to approach each conflict: with Hostility, or under the banner of Truce. Hostility results in combat, and is resolved in the manner I mentioned above. Sometimes you’ll decide to approach each other under the banner of Truce, though, which means you can settle things with words. You might agree to swap some stuff, or make a future promise for support or action. It’s all very polite. And sometimes one player will opt for a Truce while the other, despite saying they’ll also choose Truce, will actually opt for Hostility, which results in Betrayal, which is one of the main ways hostages are taken. And those hostages can then be set free or tortured in future turns. Note: here’s the official rundown on how the game works if you’d like to read in more detail/with pictures. This means that over time, as more players take more hostages and as influence spreads across the board, things get increasingly heated, and plans start to get complicated. Promises will be made and broken, alliances will be betrayed and battles will be seemingly won, only to be lost by a quirk of support or a weird character bonus effect. While most of the game is played using cards and tokens, the plastic crowns used for health/power are great. The way Iron Throne’s tension ramps up is a nice trick, as you can feel early plans and strategies start to wash away as the game develops around and past them. I also love the way it keeps a lot of key systems random, so that you can avoid a situation where a particular player becomes too over-powered, or can be bullied by a group. See, when it’s your turn to engage with another player, you don’t get to choose your opponent. You have to draw a card that tells you who to attack. It might be someone you’re plotting against, it could be someone completely random, but the way that’s dished out by chance really helps foster (and break up) alliances every few turns instead of letting the game fester. Sure, you might have been wanting to attack the Starks, but since you drew the Lannisters, maybe you can have a Truce and a chat instead? The Iron Throne is fairly short; it should run for around 45-60 minutes if everyone knows what they’re doing, and in some cases can be over far quicker if someone gets particularly crafty/lucky with their victories. It says 3-5 players on the box, and while it certainly works just fine with three people, five is probably the best setup, since it allows for more variables in terms of strategies and outcomes. The only thing that really disappointed me about the game wasn’t actually about the game at all. It was that, despite featuring a small roster of some of the series’ most memorable characters, aside from whichever one is made your leader for a particular game (any character can be given that honour) and thus granted a special ability, the rest tend to be fairly interchangeable foot soldiers, differentiated only by their art and the chance that, through the hostage mechanic, they might be wounded/killed outside of battle. The game is set immediately after Robert’s death, so features some characters we haven’t seen on the show in a LONG time. I know this has as much to do with the fact this is an adaptation, and not an entirely new game crafted specifically for Game of Thrones, but still. Given how much personality is present in the larger GoT board game, the lack of it here makes everything feel a bit more shallow than it might have been. That said, the special powers employed by each faction leader almost make up for this with their game-changing abilities; Tyrion’s in particular has the power to shape the entire game to fit his own strengths, not as a unit in a game, but as a character in the world. Aside from that, the rest of the game is a good fit for Game of Thrones, as its engagement system is a fitting distilment of the showdowns we see on the TV series. Sometimes they’re big and brash, sometimes they’re a knife in the shadows, and sometimes—just sometimes—they’re a shake of hands and an agreement in good faith. Until the knives come out later, anyway.